The second day of the rapid tournament brought another series of games full of excitement, brilliancies and heartbreaks. The leaderboard completely changed, as Magnus Carlsen reminded everyone why he is considered the most dominant chess player in the world. He is now leading the tournament with 10/12. Wesley So’s luck seemed to have ran out and he was only able to draw two games, falling three points behind Carlsen. 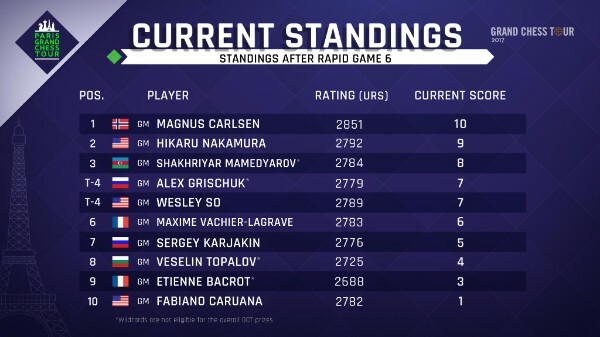 Nakamura and Mamdeyarov had a very successful day and are only one and two points behind Carlsen respectively. This was the bloodiest round thus far! 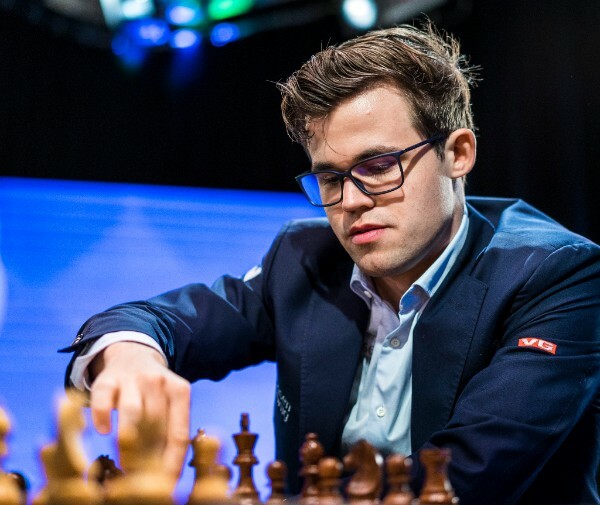 All eyes were on So-Carlsen as the leader was facing his closest rival. The World Champion completely outplayed So the entire game, only giving him one tactical chance to turn the tables, which was overlooked by the U.S. Champion. This crucial win put Carlsen in the lead. 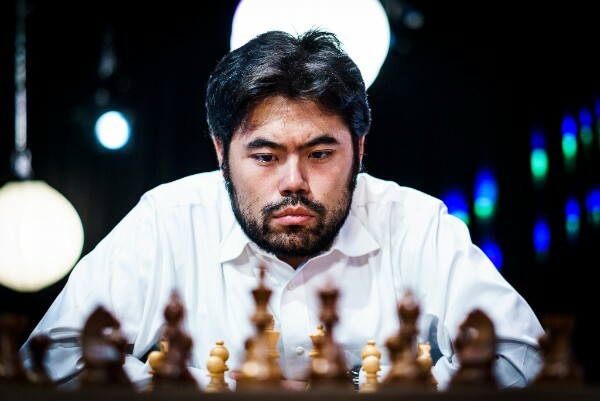 Hikaru Nakamura’s straight forward attack with a bishop sacrifice was too overwhelming for Etienne Bacrot, who found himself down three pawns and forced to resign. Shakhriyar Mamedyarov’s preparation for Grand Prix paid off in just 28 moves when Vachier-Lagrave could no longer defend his exposed king. Topalov-Grischuk was a wild theoretical battle where Black came out on top due to white forgetting his preparation at the critical point. Caruana found himself in a winning position yet again, but being in such a poor form, he could only manage to draw the game against Karjakin. Magnus Carlsen solidified his lead with a win over Topalov who did not play the most challenging move at the critical moment. Nakamura kept pace with a wild win over Grischuk. The Russian Grandmaster was winning for most of the game, but after twists and turn in time scramble found himself defending a rook vs rook and a bishop endgame. Theoretically, this endgame is draw, but practically with no time on the clock, it is quite difficult to draw. Nakamura played very quickly, not giving his opponent any time to think and find resources. Grischuk made only one error and found himself in a mating net. Mamedyarov reminded the leaders that he’s a force to be reckoned with by taking advantage of Caruana’s poor form and delivering yet another loss to the American. Karjakin bested Bacrot, another player who is struggling in this event, in only 26 moves. Vachier-Lagrave was close to beating So but surprisingly he didn’t play the straight forward winning line in the endgame, allowing is opponent to liquidate into an unwinnable position. Magnus Carlsen faced his newest closest rival, Hikaru Nakamura with the black pieces. Historically, Carlsen has been a difficult opponent for Nakamura, but this time the American was the one with a pleasant position trying to press for a win. His edge was not enough to harm Carlsen, who defended patiently and drew the game. Mamedyarov and So also drew their long game. Caruana’s fortune did not improve as he blundered a nice sequence and had to resign in yet another game where he was winning. In another shocking turn of events, Karjakin blundered his queen. Grischuk seemed quite pleased with this gift after a tough lost in the previous round. Vachier-Lagrave defeated Topalov in an interesting struggle, where he found a lot of counter play for the lost pawn. All information is available on GrandChessTour.org. Live commentary by GM Yasser Seirawan, GM Cristian Chirila, and IM Jovanka Houska will give online spectators even more opportunity to experience the tournaments. 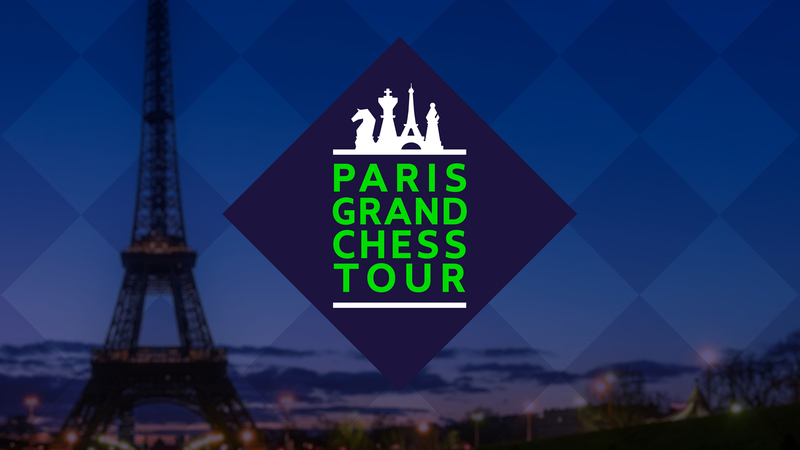 As last year, GM Maurice Ashley will be on-site in Paris to interview players and will be joined by GM Romain Edouard. Watch live.